CT Engineering’s Supercharger Package is designed by our engineers exclusively for the NSX to provide a substantial increase in horsepower that begins building at 2,000 RPM and continues all the way to redline. Superchargers are of the “Screw-Type” design that provide consistent boost and compress the intake charge very efficiently with a minimal increase in air intake temperature. This combination helps provide almost instant boost (unlike centrifugal type superchargers) to increase and broaden the torque curve substantially. 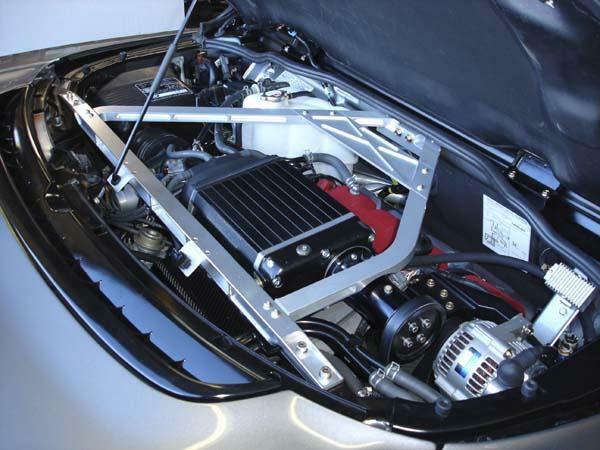 CT Engineering Supercharger Packages are 50 state legal and all components have been tested to ensure OEM reliability as well as proper fitment in the NSX engine compartment. The CT Engineering NSX Supercharger continues to be known worldwide as the only reliable forced induction option for the NSX. New NSX Supercharger Details: New Autorotor unit replaces Lysholm/Whipple unit, provides 10-15% More Horsepower, lowers inlet air temperatures, and is more easily serviceable (Fuel Rail can be removed without removing Blower Unit, easier access to the Igniter, rubber bypass tube replaced with new Aluminum tube). Product Notes: Targa model NSX’s come with a CT Engineering Billet Strut Bar and a new engine cover assembly that will accommodate the targa top. Product Enhancements: The true potential of this supercharger kit is realized with the addition of CT Engineering Headers, Cat-Back Exhaust System, and Carbon Fiber Cold Air Box Assembly. THM had the best price, cant imagine my car w/o this supercharger now.